What I know about the game of cricket could easily be written on the back of a postage stamp. I do know however, that a cricket commentator once said” The batsman’s Holding, the bowler’s Willy” which I consider (almost) side-splittingly funny. “Batting on the Bosphorus’’ is not quite so funny but it did make me chuckle quietly to myself on plenty of occasions. It’s an account of the summer the young Scotsman travelled the eastern reaches of Europe meeting cricket teams in the most unlikely of settings in the continued hope of scoring his first “international century”. The premise is that the cricket-mad Bell visited a medium who made several predictions which in combination with a chance thought (the words “Ukraine” and “cricket” popped into his mind) inspired him to surf the net and find out whether his beloved sport was played in eastern Europe. After several months spent e-mailing contacts from Minsk to Istanbul, and working in a methadone programme centre to raise some funds, Bell set off on his adventure. You don’t need to know anything about cricket to enjoy the book though I’m fairly sure cricket enthusiasts would enjoy it. There are one or two references to cricketing terms and techniques but they are well-explained and the explanations don’t get in the way of the story. There is nothing startlingly original; it’s pretty standard humorous travelogue material. It’s not as bad-tempered as Bill Bryson, not as off the wall surreal as Tony Hawks can be, but more like the witty gentle humour of someone like Dave Gorman. The humour is quite gentle and, although Bell does sometimes poke fun at the people he meets, he clearly holds back to some degree because these people share his love of cricket and, of course, he needs them to enable his dream. As you might expect Bell meets plenty of quirky characters along the way and he does a decent enough job of making them come alive. What I liked best was the travel aspect and I really envied Bell travelling around Europe in his derelict Skoda. He had visited several of these places before on a road trip with his brother and the “then and now” comparisons were interesting as the countries tried to make their way forward after Communism. Bell manages to say lots about the places he visits on his tour without the book becoming a travel guide. He knows what’s interesting and worthy of comment and his eye for the unusual – the secret police who knew nothing of cricket or an impromptu game at a border crossing – is a rare talent. 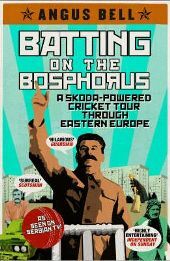 My favourite episode on Angus’s cricketing tour was his stop in Belarus where the secret police were so ignorant of cricket that they would follow the Asian students to cricket practice to make sure they weren’t involved in subversive activities. At one border crossing Bell had to set up a quick game to demonstrate the purpose of the strange items in the boot of the Skoda. The only issue I had with the book was the supposed visit to the medium. I have no idea whether Bell really did visit a clairvoyant but I felt it very unlikely – he just didn’t seem “the type”. More than that, it just wasn’t necessary to the story; simply having an idea to play cricket in these unusual destinations was interesting and appealing enough. I wonder whether he thought this made the premise funnier? He really had no need as the continual links back to the medium were tenuous at best. In spite of my enjoyment, this is not a book I’d recommend universally. I’d say it’s one for people who enjoy comical travel writing, especially alternative destinations (this is no “Year in Provence”) and certainly one for cricket fans with a sense of humour (perhaps a good Christmas present for cricket fans?) While the cricket content is quite shallow, I’m sure the scenes of improvised pitches, keen novices who’ve never seen a game played and an epic game of cricket on ice in Estonia will delight most fans of the game. No Comments on "Batting on the Bosphorus"